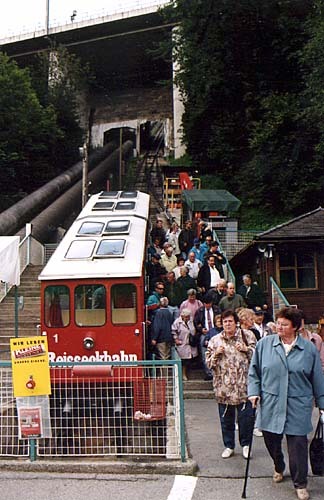 The photo on the right shows entirely the first section of the Reisseckbahn. As all the two other sections there is only one cabin on this section. There is one track with no siding. The bottom station is at Zandlach near the Kolbnitz train station. 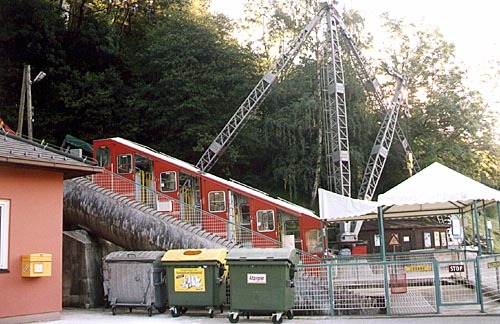 On the photo you can see that the Reisseckbahn goes under the great Salzburg to Klagenfurt train line. 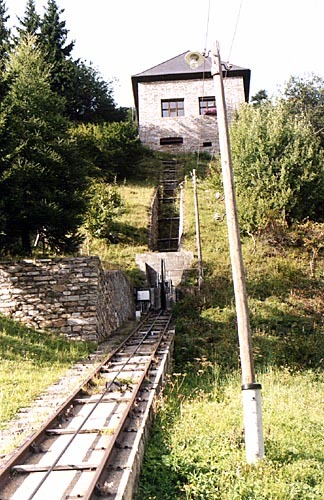 The cable railway goes along the the pipeline which the one of the highest (may be the highest) waterfall in the world. As you see the profile of the track closely follows the curves of the slope which are made of concavities and convexities. On this section there are 2 porticoes which prevents the cable not to be too much raised up by the concavity of the line (see my article about the Vermuntbahn to see such a portico). At the top of the photo the big white building is the top station of the first section; more precisely it is the building where is located the engine of the first section. 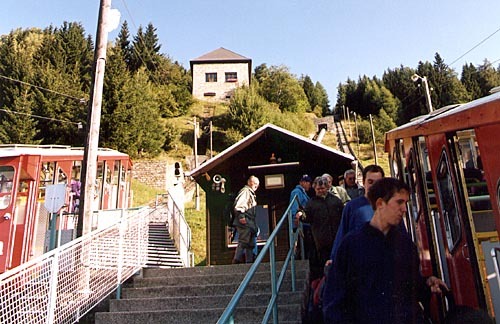 The bottom station of Zandlach (719 m). Crowds of people at the arrival of the cabin on a Saturday evening. A cabin can carry 64 passengers and I can assure you that on the last rides of the Saturdays the cabins are really full of people!!! The three cabins of the three sections are the same model and are all three red. Each cabin has a number (1, 2 and 3) corresponding to their section. The station is just under the bridge of the train. You can notice, on the right of the photo, a siding track where is parked a platform with a crane for the maintenance. On the left are the office of the Reisseckbahn and a restaurant. 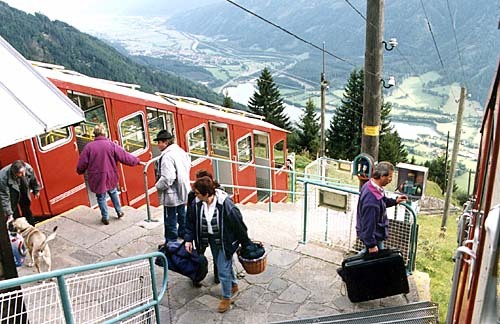 Schütter (1286 m), the top station. The end of the first section; you have to get out the cabin 1 (on the left) and get in the cabin 2 (on the right) which is waiting for you. You recognize the big white building which is the power station of the first section. On the right is the track of the second section. The cabin 2 is on the left. The track you can see between the two cabins is the end of the second section, not the first section! In the background, the splendid valley of Mölltal. 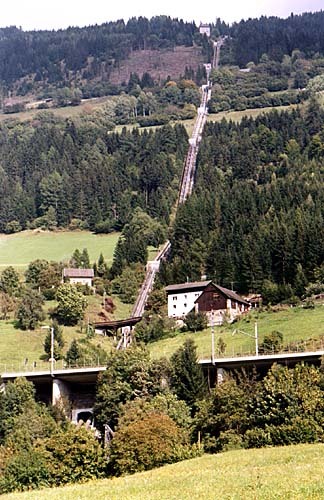 Interesting photo of a part of the Schütter station which shows, from right to left, the pipeline, the track of the first section, a track which links the two sections and which can be used to transfer a cabin from one section to the other, and on the left the end of the track of the section 2. On the background, on the other side of the valley, you can see two vertical cuttings in the forest. The one on the left is the Kreuzeckbahn. 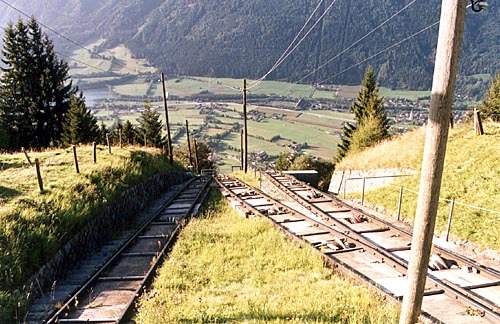 Another interesting photo of the Schütter station which shows the end of the track of the section 1. The cable goes up to the white building where is the engine of the section 1. The cable enters the building through the horizontal black slot. You can see that this time the problem of the concavity of the profile is solve with a big vertical pulley (with a diameter more than 2 meters) which forces the cable to exactly follow the profile of the track. From the pulley to the building there is no more rails (of course), only horizontal pieces of wood to support the cable.